The story of Phyllis is a particularly sad one. Her father, who had worked on a farm, died of heart failure caused by over-exertion and exhaustion. This was in 1903 when Phyllis was three years old. Her mother was left with six children and another on the way. They were living in Kenton in Middlesex. A month and a half later and Phyllis’ mother was struggling. Phyllis’ eldest sister, Dolly, was working as a servant and living away from home. Another of Phyllis’ siblings went to live with relatives, but this still left four children for Phyllis’ mother to provide for. The shock of her husband’s death had made Phyllis’ mother unwell, so much so that the family’s doctor thought she would need to have a serious, and potentially fatal, operation. She wasn’t working and the family was living in temporary accommodation, which they would soon be forced to leave. 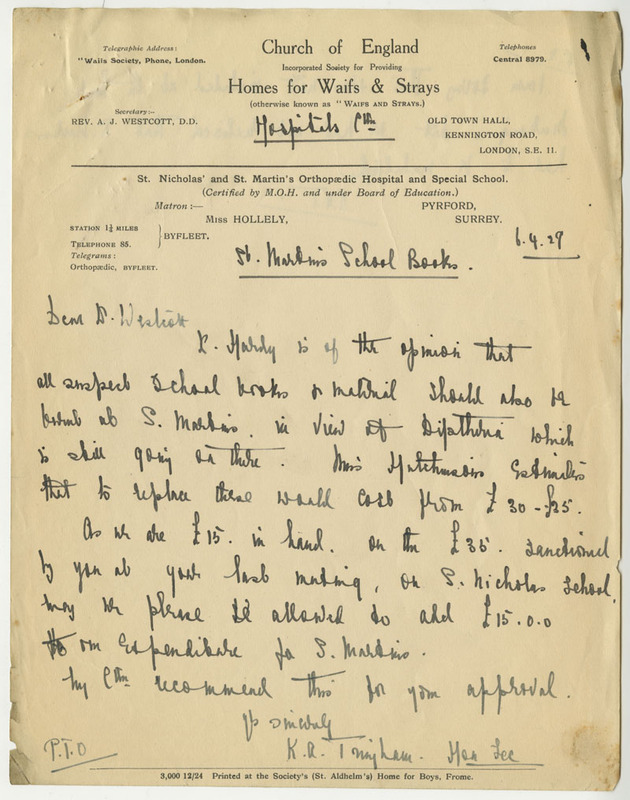 For all these reasons an application was made for Phyllis and her elder sister, Ida, to enter the care of The Children’s Society (then known as the Waifs and Strays Society). 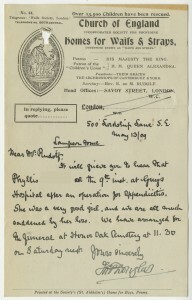 One month later, both Phyllis and Ida entered The Society’s Lampson Home in Dulwich, London. Here they both stayed until 1908 when Ida returned back to their mother. At this time their mother was unwell again, as was their grandmother who had been helping her. Ida was 15 years old by this point; she returned home to help her mother, and the intention was for Ida to go to work in domestic service once her mother was well again and no longer needed assistance. Hospital after an operation for Appendicitis. … she was one of the nicest little Girls in the Home & a great favourite with us all & also with her teacher & her school-fellows, her teacher was particularly fond of her. 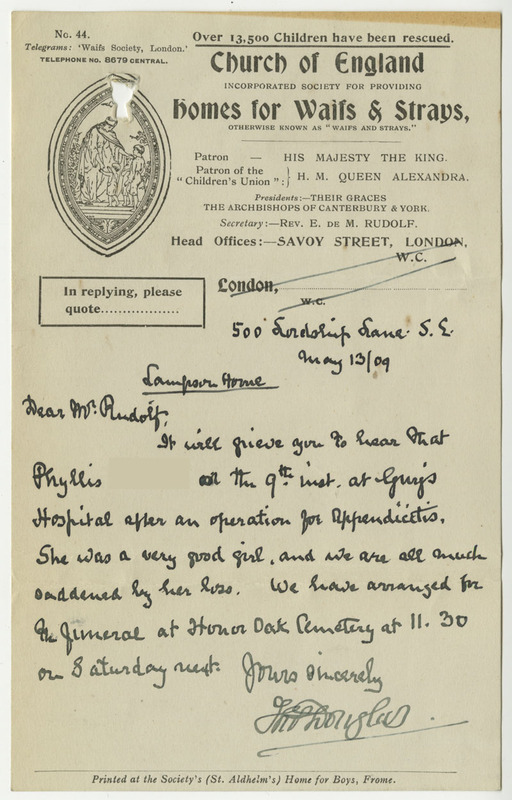 Sadly for Phyllis, it seems that the operation wasn’t able to save her, despite having been treated at the prestigious Guy’s Hospital in London. The causes of her death are given as appendicitis, peritonitis (inflammation of the lining of the abdomen) and heart failure. Appendicitis was first named in 1886 and surgery to treat the disease started to become more common after that point. Most famously King Edward VII had to postpone his coronation in 1902 in order to have urgent surgical treatment for appendicitis. Edward VII’s operation was successful but, sadly, not everybody survived the new surgical technique. From what we have found so far in the Unexplored Riches in Medical History project, appendicitis was fatal in 40% of cases of the disease. These figures only come from a small sample, so they are likely to change as the project continues, but it does suggest that surgery to treat appendicitis over one hundred years ago was not any way near as successful as it is today. In many cases, it was not the surgery itself but complications of the disease that proved to be fatal. Mortality rates were high for people, like Phyllis, who were also suffering from peritonitis, which is an infection of the lining of the abdomen. Surgery to treat appendicitis would remove the infected appendix, but if the infection had already spread to the rest of the abdomen, there was little that could be done. Mortality rates only began to drop when antibiotics started to be used alongside surgery in the 1940s and 1950s. 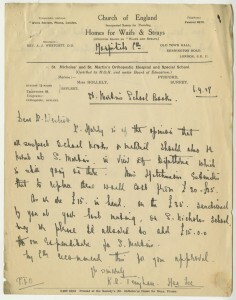 Unfortunately for Phyllis, in 1909, with her complications her prognosis wouldn’t have been good. Surgery would have been her only hope for treatment, but it seems that her disease was so far gone that even that wasn’t enough to help her.